Einstein’s General Theory of Relativity (GR) successfully describes gravity. Although GR has been accurately tested in weak gravitational fields, it remains largely untested in the general strong field cases. One of the most fundamental predictions of GR is the existence of black holes (BH). After the recent direct detection of gravitational waves by LIGO, there is now near conclusive evidence for the existence of stellar-mass BHs. However, we still have not yet seen the event horizon – the defining feature of a black hole. Are Black Holes observable astrophysical objects? Does GR hold in its most extreme limit or are alternatives needed? 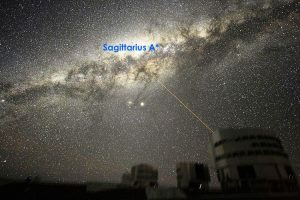 The prime target to address these fundamental questions is in the center of our own Milky Way, which hosts the closest and best-constrained supermassive BH candidate in the Universe, Sagittarius A* (Sgr A*). Another target is the supermassive black hole in the center of the giant elliptical galaxy in M87. 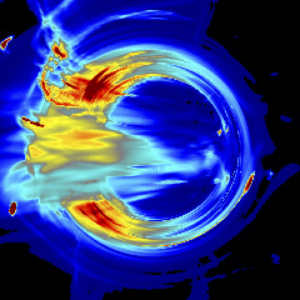 The ERC-funded BlackHoleCam project aims to conduct GR tests in a strong-field regime using three different types of observations of Sgr A* and M87 with new-generation instruments. We provide more details about these observations below. The first experiment consists of making a standard astronomical image of the synchrotron emission from the relativistic plasma accreting onto Sgr A*. This emission forms a “shadow” around the event horizon cast against the background, whose predicted size (about 50 microarcseconds) can now be resolved by upcoming very long baseline radio interferometry experiments at mm-waves such as the Event Horizon Telescope (EHT). The second experiment aims to detect and study a radio pulsar in tight orbit about Sgr A* using radio telescopes (including the Atacama Large Millimeter Array or ALMA). The synergy between these three different techniques will eventually enable us to measure fundamental BH parameters (mass, spin, and quadrupole moment) with sufficiently high precision to provide fundamental tests of GR (e.g., testing the no-hair theorem) and probe the spacetime around a BH in any metric theory of gravity. Therefore, the Galactic center provides a unique fundamental-physics laboratory for experimental tests of BH accretion and theories of gravity in their most extreme limits.